The increasing amount of African Americans studying and working in science, technology, engineering and math (STEM) fields is revolutionary. Largely due to the efforts of the country’s historically black colleges and universities (HBCUs), African Americans are entering their STEM degrees better equipped to thrive in college, to graduate and to find successful careers. UNCF is a proud supporter of its 37 member HBCUs and of a variety of programs dedicated to helping young African American scientists-in-training reach their goals. Despite recent progress, the statistics concerning African Americans in STEM fields show a clear need for growth. Black and white students across the country intend to pursue STEM degrees at similar rates, but black students in any STEM field struggle to achieve comparable representation in degree attainment. The Penn Center for Minority Serving Institutions reports, for example, that black students studying engineering earned only 4.2 percent of bachelor’s degrees in 2012 across the United States, while white students earned 68.1 percent. Importantly, the nation’s HBCUs help to address this need. Twenty five percent of African American graduates with STEM degrees come from HBCUs. HBCUs graduated 46 percent of black women who earned degrees in STEM disciplines between 1995 and 2004. Eight HBCUs were among the top 20 institutions to award the most Science & Engineering bachelor’s degrees to black graduates from 2008-2012. HBCUs are the institution of origin among almost 30 percent of black graduates of science and engineering doctorate programs. A large part of preparing first-generation, low-income African American students for success in STEM is providing the resources and guidance that they often lack long before enrollment in college. According to the UNCF report, “A Seat at the Table: African American Youth’s Perceptions of K-12 Education” K-12 education should should implement improved school-based practices to increase African American student achievement. Particularly, that youth should be exposed to various opportunities in STEM fields to spark greater interest in math and in college. Many African American high school students lack access to the educational resources needed to prepare them to earn STEM degrees. The U.S. Department of Education reports that, among public high schools serving predominantly African American students, less than one-third of schools offer calculus and about 40 percent offer physics. African American students represent 16 percent of the country’s high school students, yet only 9 percent of them take an AP (Advanced Placement) course. It is for these reasons, among others, that many disadvantaged African American students are not prepared to pursue and succeed in a STEM degree in college. 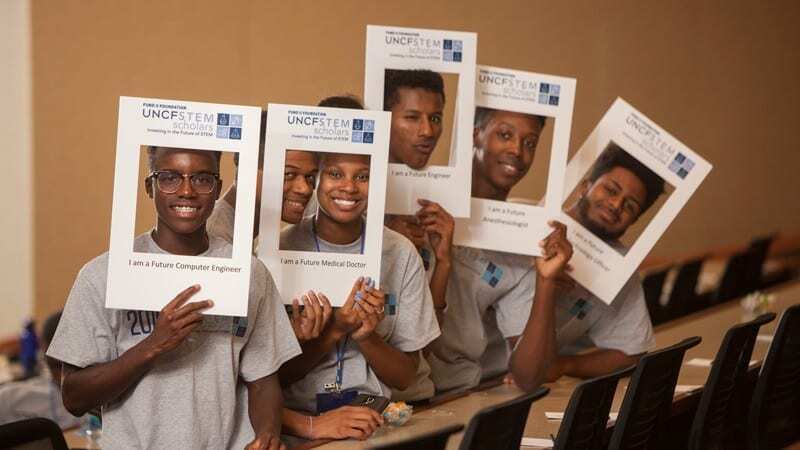 Seeing the need to equip African American high school students with the skills and resources to successfully pursue careers in STEM, UNCF partnered with the Fund II Foundation and established a scholarship program to help African American students seeking careers in STEM fields. Over a period of five years, the Fund II Foundation UNCF STEM Scholars Program is identifying 500 African American high school students pursuing careers in STEM fields. These scholars will receive scholarships, internships, mentoring, and other tools to help them reach their goals. Overall the Fund II Foundation is contributing $48 million for the STEM Scholars Program. UNCF has also invested in several programs that help African American STEM students during their time at college. The UNCF/Merck Science Initiative (UMSI), a 15-year partnership between UNCF and Merck, a global healthcare leader, supported 554 African American undergraduate, graduate and postdoctoral science students by providing them with financial support, hands-on training, mentoring, networking relationships, and institutional support. Merck awarded UNCF a 10-year, $20 million grant in 1995, and the partnership was renewed in 2006 to provide more than $13 million in additional funding through 2010. Recipients have achieved successful careers in biochemistry, microbiology, pharmacology, neuroscience, biophysics, chemistry, and bioengineering. On Oct. 10, 2018, UNCF convened 150 fellows and more than 20 faculty members representing more than 40 HBCUs at the 6th Annual HBCU Innovation Summit in Silicon Valley, connecting HBCU leadership, faculty and 150 competitively selected students students to the Silicon Valley tech community. Students visited 14 Silicon Valley/Bay Area tech companies, HBCU computer science/engineering faculty shared best practices in computer science pedagogy, and HBCU leadership shared ideas on how HBCUs can support innovation on their respective campuses. Students traveled around Silicon Valley and the Bay Area on the “Silicon Valley Tech Trek” and visited summit sponsors, including big-name companies such as Google, Pixar, and Twitter. Students met chief technology executives and engineers during panels and workshops, and they had the opportunity to network with recruiters, engage in technical and professional development workshops, and interview on-site for jobs and internships. Factors that prevent first-generation, low-income African Americans from succeeding in STEM careers are present before, during, and after a student earns his or her degree. It is for this reason UNCF is involved from start to finish—from high school to career achievement. By providing the right tools and guidance, UNCF looks forward to seeing STEM fields diversify at an increasing rate and to seeing more students reach their goals.